Chaplain (Capt.) 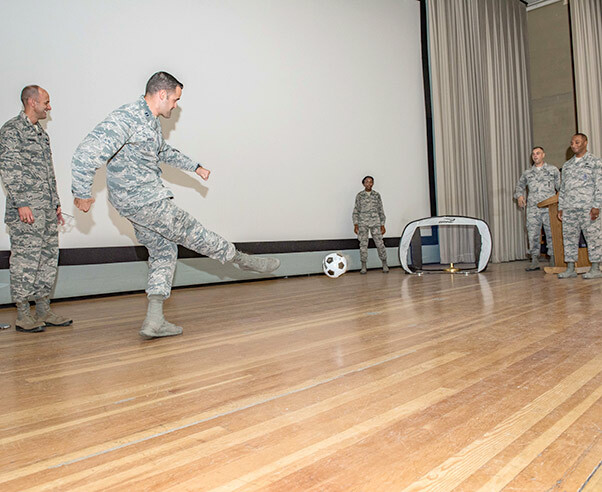 Matthew Spurgeon kicks a soccer ball into a portable goal during a 412th Test Wing commander’s call and second quarter awards ceremony held in the base theater Aug. 23, 2018. 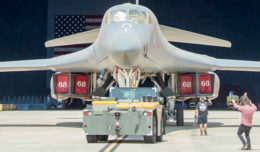 The 412th Test Wing at Edwards Air Force Base, Calif., held its 2018 second quarter awards ceremony in the base theater in conjunction with a commander’s call Aug. 23. Top performers were announced and brought up on stage in front of a cheering audience to be handed their award by Brig. 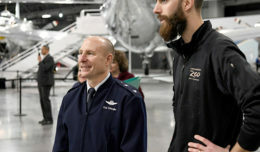 Gen. E. John Teichert, 412th Test Wing commander, and Chief Master Sgt. Roosevelt Jones, 412th TW command chief. This quarter’s ceremony theme was soccer so all winners got a chance to kick a ball into a goal as the packed theater cheered.